As anyone who has gone to the doctor knows, clear communication between doctors and their patients is essential to quality healthcare, but the communication skills of many doctors are never formerly assessed. To help improve communication between doctors and patients, a group of UK and US researchers are looking to Artificial Intelligence (AI). 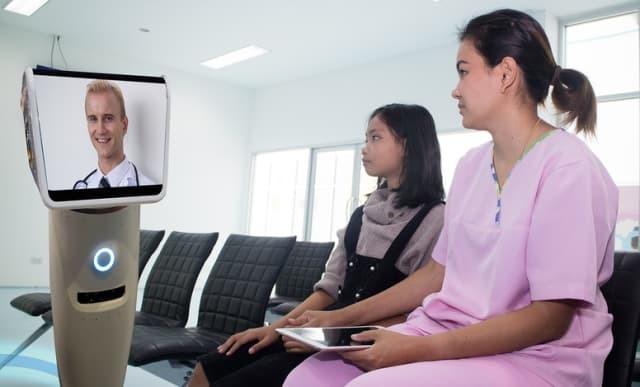 Senior author and Dartmouth Institute Professor Glyn Elwyn believes that AI may have the ability to provide doctors with personalized, detailed feedback on their communication skills. Elwyn and his team of researchers from The Dartmouth Institute for Health Policy and Clinical Practice, Trinity College Dublin, and the University of Edinburgh have explored the potential uses of AI in the following three areas. AI could be used to analyze specific words and phrases to evaluate if doctors and patients are communicating effectively, by checking whether doctors are using jargon-free language, taking appropriate patient histories and offering evidence-based treatments. The hope is that AI could eventually be used to help provide diagnoses and treatment options based on conversational analyses that doctors may not have considered. For a refresher course on lessons learned in kindergarten, AI could evaluate whether or not doctors give patients a turn to talk. AI could track the amount of time the doctor speaks compared to the patient and if the doctor gives the patient enough time to ask questions or voice concerns. This is especially important since a correlation has been shown between allowing patients sufficient time to speak and improved ability of patients to both recall information and adhere to the prescribed medicines. Previously, vocal pitch and energy have been used to evaluate the tone and style of speech. The researchers suggested that AI could use this same technique as a tool to track important information about both doctors and patients. For doctors, it could be used to identify when they are under unusually intense stress or heavy workloads. For patients, it could be used to gain information about physical and mental health. As examples, depressive episodes are typically marked by a change in vocal pitch; vocal changes that occur due to a build up of fluid in the lungs and vocal folds is an early sign of heart failure. Though Elwyn and his team believe that AI has a lot to offer the healthcare industry, they also acknowledge that the use of this technology in the field of healthcare poses many challenges. One example is the complexity of the dialogues in medical encounters. This complexity is something that skilled doctors have mastered, but it is currently beyond the technological capabilities of AI. The fact that AI is even being considered in these ways shows just how far it has come in a short period of time, but whether the healthcare industry can effectively employ it and doctors will be open to it, remains to be seen. The research was published in The BMJ. For more information on AI in healthcare, check out our feature, A Healthy Future for Artificial Intelligence in Healthcare.